Nick Lewin’s Ultimate Card in Envelope. 100% astounding! 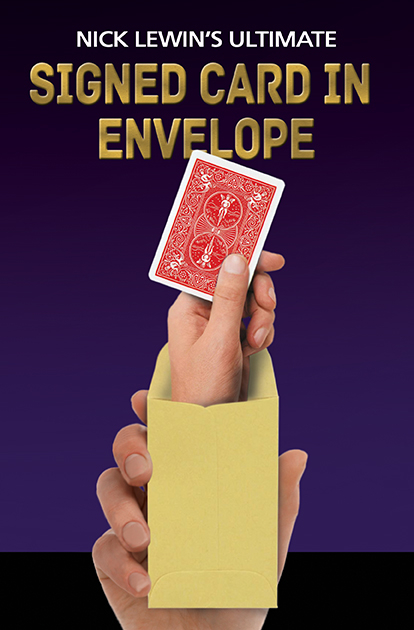 Your spectators will be truly astonished and amazed as a chosen and signed card apparently arrives inside an envelope that has been resting on the table since before the trick started! A stunning piece of extreme close-up magic. Clean, powerful, and simple to learn. This handling is so deceptive that it can achieve a stunning effect with minimal effort. In other versions when you might run the risk of palming a card while in this routine you avoid any risk of being “caught” and get a big laugh while you do so! This is smart magic. No pre-set, no palming and zero re-set. Perfect for the strolling magician. The performer who is willing to spend half an hour in front of a mirror practicing this routine will be rewarded with a gem of close up magic that you will perform time and again. Everything you need to perform this routine is supplied in duplicate, all you need to add is a red backed deck of Bicycle playing cards and that half hour in front of the mirror.